Once again extremely happy with my latest purchase of 2 digital cables. For the quality of the cables the price was fantastic, similar cables purchased in the past from other suppliers were 2 to 3 times the cost of these. I purchase regularly on the internet & must say that I find it hard to believe the speed of delivery. I live in a rural suburb of a major country city in Victoria & deliveries from Cable Chick are quicker than orders from local suppliers. Fully recommend your site to all. Home Theatre products for the best quality AV Accessories at the lowest prices every day! 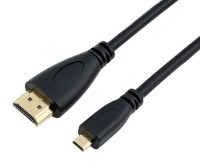 Micro HDMI (Type-D) to Regular HDMI (Type-A) Cable for devices like smartphones & tablets. Most Popular ! In-Stock & Ready to Ship! Did you know Cable Chick also have Headphones?